The relation between channel width and stream physical habitat in the lower Platte River in eastern Nebraska was studied as part of the lower Platte River Cumulative Impact Study. The purpose of this component was to document the grain-size distribution of sediment deposited as specific types of physical features, such as sandbars, banks, and stream beds within different hydraulic habitats, within the lower Platte River system. In so doing, the major sources of sediment for sandbar creation downstream are described. Sediment samples were collected from 11 reaches of the lower Platte River from Silver Creek, Nebraska, to the mouth of the Platte River, and from 4 tributary streams. Two bed-material samples, 2 bank-material samples, and 3 sandbar-material samples were collected at main-stem sampling sites, and 1 sample each of bed material and bank material was collected at each tributary sampling site. Aspects of channel geometry, such as channel width, sandbar height and width, and bank height, were measured at each sampled site. This report presents the channel-geometry results and documents the sample-collection methods. 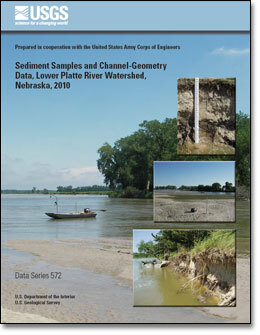 Schaepe, N.J., and Alexander, J.S., 2011, Sediment samples and channel-geometry data, lower Platte River watershed, Nebraska, 2010: U.S. Geological Survey Data Series 572, 22 p.